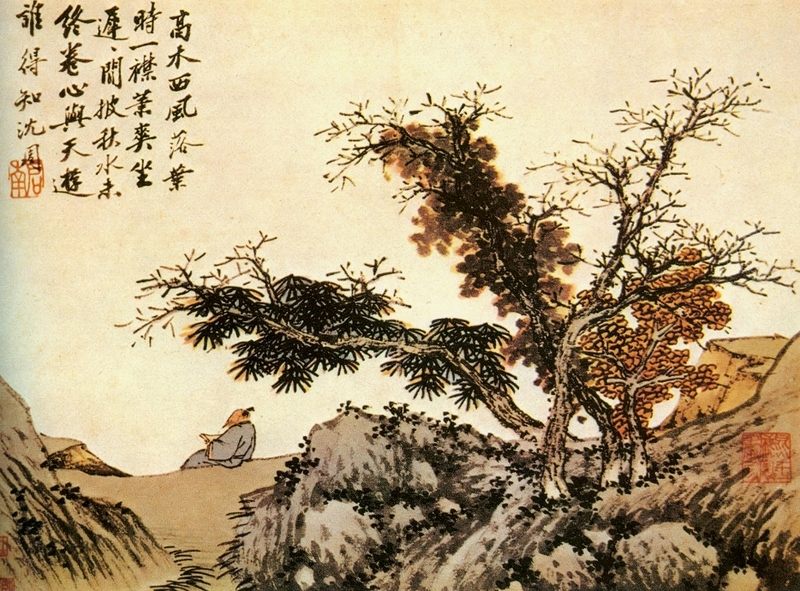 I’ve always admired the translations of Chinese poetry – I’m no expert on the field, but there are two poets named Du Fu and Li Bai that I really like. They were legendary masters from the Great Tang Dynasty, and (if the translations are accurate), they had a phenomenal talent for freezing a moment and capturing that particular slice of time with their words; their poems read like a string of Polaroids stretched across a riverbank. Which I suppose is why this appeals to me – there’s a rare clarity here, even if the translation might be inaccurate. So the Tang poets seemed like the right place to start with for my experiment with machine-generated art (and besides, the excellent GWERN already did the usual English). Right now, I’ve snuck away for a few hours from a my statistical models to peek at the code I set to run this morning. Among those of us who work with machine learning, the work I’ve put into this whole project is trivial: a tiny dataset, a cup of coffee, a few lines of Python code, and a single cigarette while I waited for OpenAI’s transformer-based generation model  to download. The OpenAI model, like most neural networks, can be thought of as a rough analogue of a human brain – a collection of artificial neurons strung in layers, lighting up as fragments of thoughts (inputs) pass between one layer and the next. We teach it by pointing it at something and telling it to produce something similar. The boffins at OpenAI have decreed that their full model is too complex and human-like to release – God knows what people might do with it in this age of fake news – and so they’ve banged the drum and let out only a tiny, child version of their beast, the GPT2 117M. No matter. We shall use the child. I’ve set it to train on a collection of Tang poetry, and given my personal biases, both Li Bai and Du Fu feature prominently in here. It has digested and spat out some poetry at me, and I, acting in a role much like a subeditor at a newspaper, am going over copy turned in by the new journalist. Here are our first results: six poems handpicked out of ten efforts. My edits have been to delete no more than two lines per poem. To be in Baok Sha. Below, I see the greenness and the restlessness of water…. Here in my bright mirror, come back and look at me! This isn’t the best poetry I’ve seen, but it isn’t the worst. Parents, I understand, try to get children to write poetry all the time – mine certainly did – but it generally takes many years before the little bundle of joy stops shitting their diapers and decides to take on Robert Frost. I’ve spent maybe three hours of my time on this so far, and most of that was spent sorting out code issues. I would climb the Taihang Mountains, but the sky is blind with snow…. But I suddenly dream of riding a boat, sailing for the sun…. Which am I to follow?…. You have found your home. Washing their fields and burning them. And east to receive the rain from the Spears of Heaven. And our footprints are three hundred miles away. How can I bear to sweep them away? A vanished river is forgotten by the people…. Who knows if it is still alive? … Who knows if it ever was? Those last two lines, I have to stress, are most definitely not mine. There’s a man I keep coming back to whenever I see something like this, and that’s the chessmaster Gary Kasparov. Kasparov is possibly the greatest human chess player we have seen to date; from 1986 to 2005 he was the world’s best at the game. In 1997, Kasparov was defeated by a machine – IBM’s Deep Blue. The move changed chess history , and I think – looking back – that’s really where the “human vs machine” fear really hit home. Ever since then, chessmasters – the human kind – have accepted getting thrashed by machines. What did Kasparov do? Kasparov went away and made computer-aided chess work. He took human vs machine and made it human + machine. His thesis is in the title of his TED Talk – “Don’t fear intelligent machines; work with them” . Today, some of the world’s most powerful players are cyborgs – combinations of human players and machine intelligence – and they are damned difficult to beat . I believe in this human + machine philosophy. Over the next year or so, I’m going to be launching more little experiments along this line. Let’s get see where it gets us. A friend of mine, a mathematician, recently posited to me that the role of poetry was capture intricate emotion; I countered by saying the role of poetry was to convey information through the ordering of words as much as the words themselves. But in both our arguments there was the implicit understanding that there was a poet, some creator with a sense of purpose, be it information or emotion. I wonder if we can have the same argument about this, or whether we have to start that argument again with several biases removed. *edit note: this article formerly read “GPT 2 110M” instead of “117M”. Fixed.